Backing up our blog database is very important, especially if you have already growing blog with loyal visitors, and even you earn money from it. I have posted this video some years ago in about 2 minutes times, that I personally need most to backup without logging in to my dashboard. In that video tutorial, I don’t use a wordpress database backup plugin. 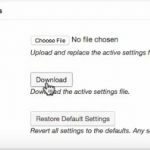 I have use the video tutorial here, about how to backup and restore wordpress to restore this blog a few months ago. I am the typical person who likes to modify that and this, adding some more ads 😀 or delete some of them, modifying htaccess and stuff, this things are dangerous for me, if i don’t do backup first. 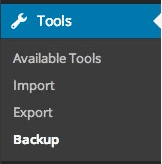 I have tried many other wordpress database backup plugin, but I have found wp-db-backup plugin is the best and easiest to use that you can use. I mean the best, because it just works. I have tried BackWPup plugin, but it didn’t send email. Other than that, this plugin has the option to backup wp-content, and all the files we need on a blog (including images), however if my blog is quite big, I think backing up wp-content including the images will take forever. So no wonder it didn’t work somehow. So my method is, backing up the database automatically and regularly with this plugin, and then, backing up all the files manually at least once a month. This plugin is available to install in your dashboard, or you can download it from wordpress plugins page. Actually, once you are finished with the installation, you can activate it, and then look for “Tools” and “backup”. By default, the plugin will definitely backup the standard WP database tables, but as you can see in the image below, you will still be able to choose any other tables you want to back up, and which not. You can specifiy which files you want to backup, including “exclude spam comments” tick box. (see image above). Then, on the right side, there are a few database tables options from another plugins or themes you installed, choose any tables you think you will need to be backed up. In my newest video, I didn’t have this, because the blog demo I used was really new. After all ticked, you are going to see how you want to backup. Save it to your server. This will enable you saving the database backup in your server, which i don’t really recommend, because it can be downloadable if someone knows the path. I use this option, if i want to modify some stuff in this blog, or before upgrade if there is a new update of wordpress. This option will send the database right away to your email address. If you now click “Backup Now!” button, it will be sent to your email address or downloaded to your computer, depends on which options you choose. This will send you the backup to your email address regularly and automatically. It means, you don’t have to go to the settings again, and press the backup now. The more often database backup, the more chance you can always restore your site back to where it was. 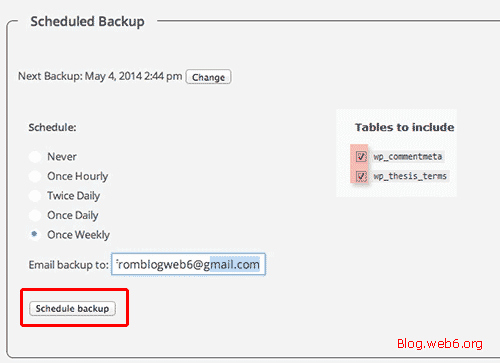 After choosing how often you will receive it in your email address, you can then press “schedule backup” button. The option will be updated and be sure to check your email daily or weekly. 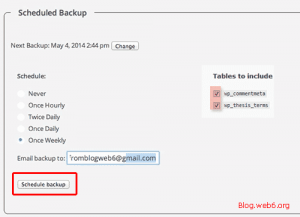 That’s how I use wp-db-backup, a wordpress database backup plugin.